“Do you like Pina Coladas, and getting caught in the rain?” You can stick the rain, but damn right I like Pina Coladas! However, they aren’t usually acceptable before 9am, so you might have to make do with my Tropical Granola. If you decide to top it with rum instead of coconut yoghurt to help you adult, there’s no judging here. Whizz the almonds in a food processor to a rough crumble. Put into a large mixing bowl. Next, whizz the cashews and macadamias in the food processor. I do these two nuts separate to the almonds because they are softer and break down too quick if done together with almonds. Add these to the almonds in the large bowl along with the coconut and salt and combine. Add the juice, oil and honey and stir well, coating everything. Spread in an even layer onto a baking tray lined with baking paper. Bake for 20 minutes. Keep an eye on it for the last 5 minutes, in case it starts to get too toasted. Remove from oven and let cool on the tray. It will harden with cooling. 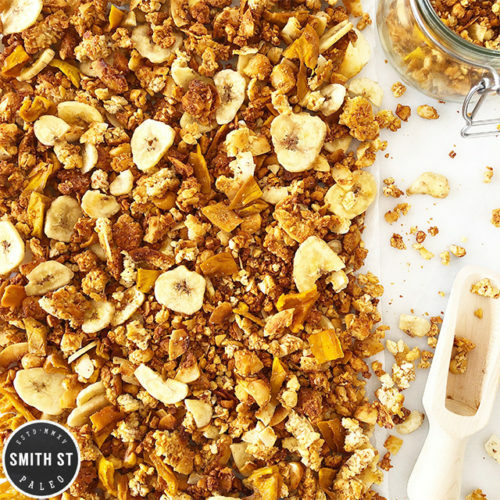 Use a spatula/egg flip to break up the granola and lift off tray. Mix through the dried fruit and store in an airtight container.